Apart from the everyday watch, that you will never see me without, or the occasional bracelet, I was never really a huge jewellery wearer until the past year, when I have begun to love curating a collection of some of my favourite pieces. 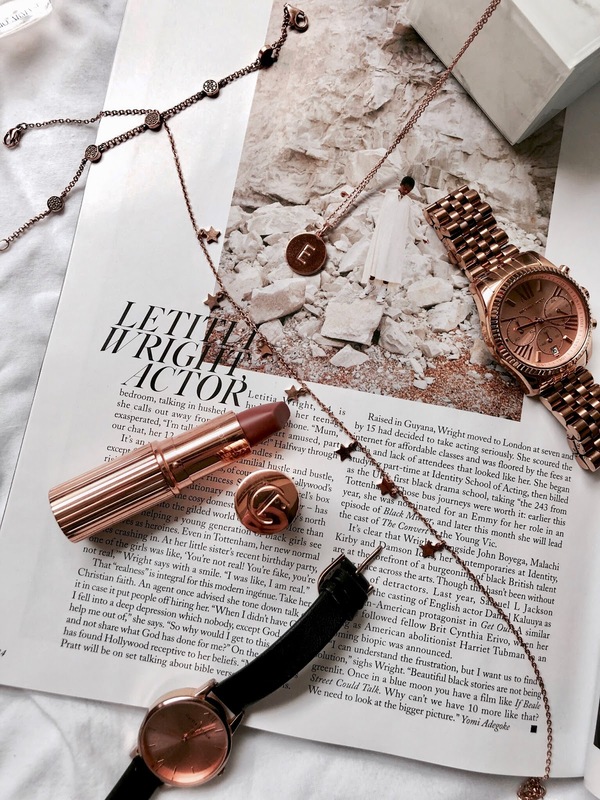 Rose gold has to be my favourite of the three metals so today I am sharing my favourite rose gold accessories in my collection. As I mentioned, you will never see me without a watch; even though we're all able to quickly check your phone nowadays, I've just always loved having a watch handy. I have two rose gold favourites, the first of which is my everyday essential, the Olivia Burton watch. 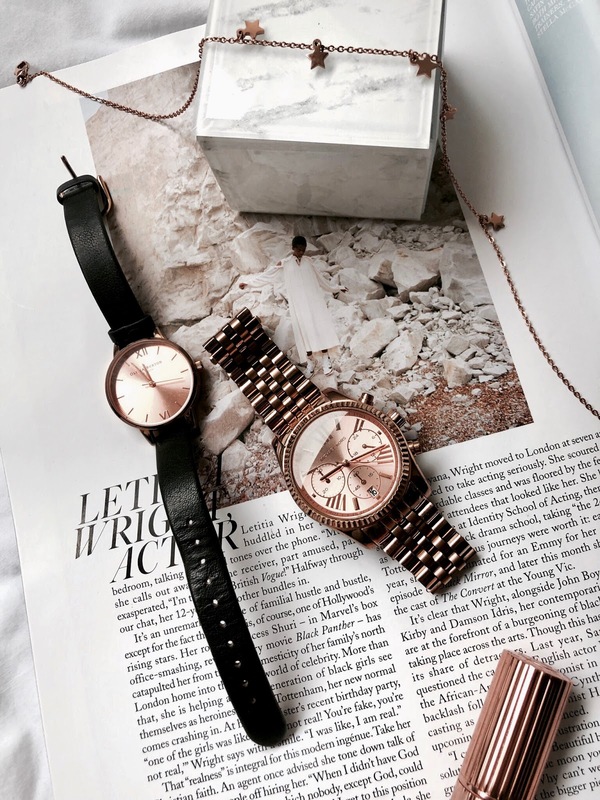 There are so many different styles of their watches, right now I have the classic black leather strap with a midi rose gold face and I absolutely love it. It is looking a bit worn by now, so I do plan to get another one next year, but I have worn it every day for over a year now, and it has had the fair bit of paint accidentally splodged all over it in its time! My other watch favourite has to be my Michael Kors watch. Although this became an everyday watch when I got it a few years ago, it has become a more occasional piece now, since I realised when I started wearing my light leather Olivia Burton watch how heavy this one feels! It has a gorgeous large face with a bunch of dials... I don't really know what most of them do but it does display the date which is super useful! I don't know how I used to wear this all day because nowadays my arm gets tired after a few hours but I love wearing it when going out-out. I have two Thomas Sabo bracelets - a silver charm bracelet, and this lovely understated rose gold bracelet. I love how dainty it is, which is handy as I am often pairing it along with a watch. It's super pretty and an item I can't believe I have had for over two years ago since I got it for my sixteenth! It's one of my favourite accessories for adding a little something extra to my look. It's so weird how I never wore necklaces until a few months ago when I got my Tiffany necklace, and now I feel strange not wearing one! The collection has grown quite rapidly since then, a recent addition of which comes from The Happiness Boutique. I have always been in love with all things star-related so choosing their Star Delicate Necklace* felt very on theme! I love how it has several pendants making it a little different and the shorter chain means I can wear it with higher necked items. 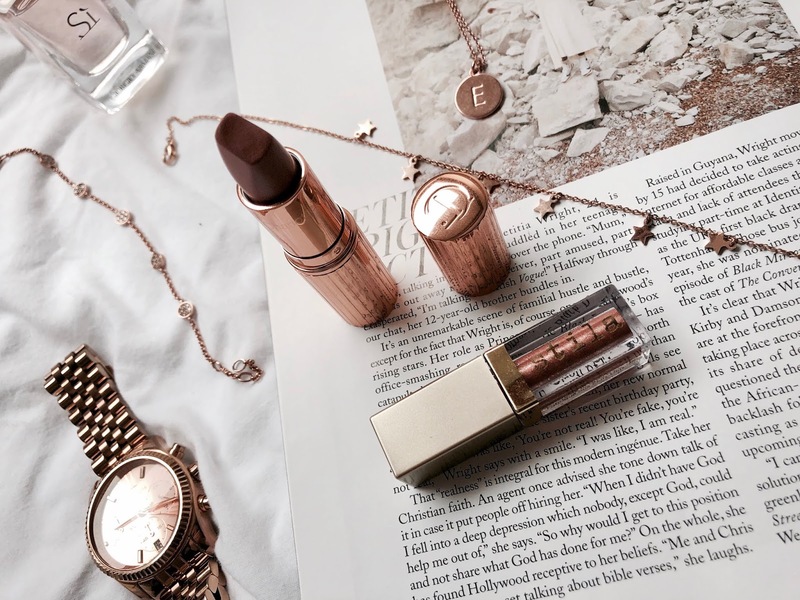 It has definitely become a staple to my rose gold jewellery collection, and you can get 10% off all Happiness Boutique products over £19 with the code 'everythingerinx' from now until February 23rd - how exciting is that! 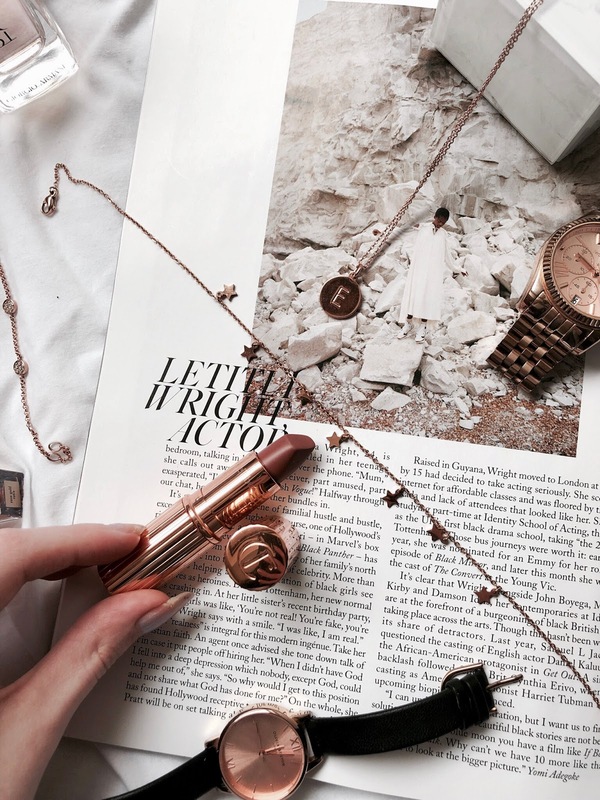 The rose gold Kate Spade pendant necklace is another favourite of mine right now. I received this for Christmas and have been obsessed with it ever since. The pendant itself has an engraved E, and says on the back 'one in a million' which is a gorgeous touch. I am obsessed with Kate Spade products and my necklace is no exception. It's so versatile that it can match with anything and it has so many links that it can be worn at a variety of lengths. Of course, I would be obsessed with any makeup or beauty item with a rose gold touch - what do you expect! If you feel like making your lipstick match your accessories, look no further than Charlotte Tilbury's packaging; I may have wanted one for a really long time just for the packaging, so it is an added bonus that the lipstick itself is fab too (I have the shade Very Victoria, but there is a huge range for whatever you fancy). 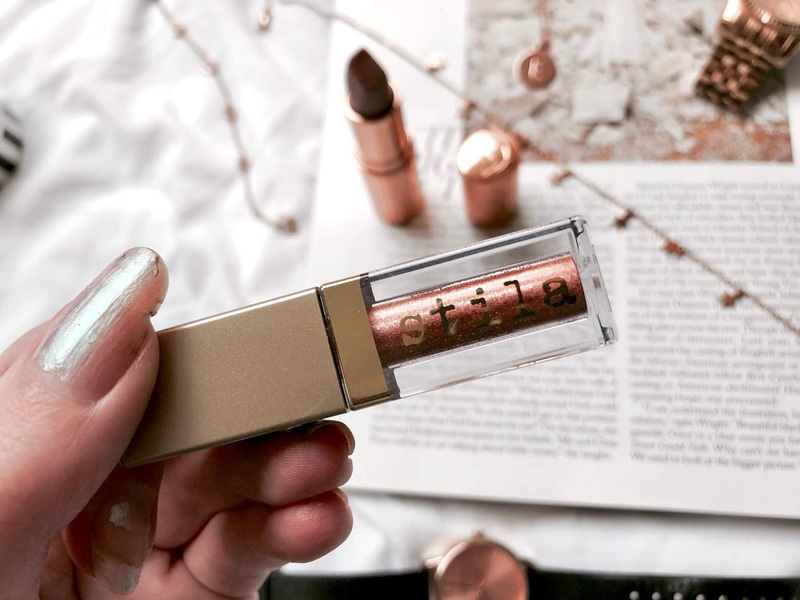 However, if you really want to go all out rose gold on your face to match your accessories, rose gold eyeshadow is a huge deal right now - my favourite of which to go all out with is the Stila glitter liquid eyeshadow in the shade 'Rose Gold Retro'. The shade name already suggests how fabulous it is - rose gold glitter lids to match my jewellery is a yes from me! What are your favourite ways to accessorise right now? Rose gold makeup forever! I'm usually a silver jewellery wearer but I'd love to add some rose gold accents in there! Love how simple and minimalistic your pieces of choice are - I'm the same with all my jewellery and I keep them all the same colour too!